Have you ever used Coconut Oil? Honestly I never knew what it was for till now. First of all it's a healthy form of cooking oil, one of the best ones you can use. Who knew? This is only one of the uses for Coconut Oil. I can't wait to try it out with my cooking. Did you know you can also use Coconut Oil on your skin too? 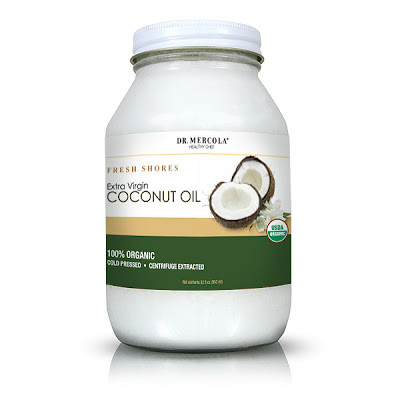 Massage therapists have been using Coconut Oil for a long time, and you can as well, as healthy lotion for your skin. It's supposed to work well to heal anti aging skin and reduce wrinkles. It is known to give you a more youthful appearance as well. Personally I liked this as an exfoliator for my face. I'm not sure I would recommend it for oily skin, I have dry to normal, so I'm ok to put oil on my face, but many wouldn't be able to for fear of breaking out. Are you still not convinced that Coconut Oil is a must have? I haven't tried cooking with it yet but I have experimented on my skin, and having dry flaky skin and also battling excema, I have to say the Coconut Oil has made a difference. I love slathering this on my arms and legs after I get out of the bath for not only a yummy scent, but softer smoother skin. Being 7 months pregnant I'm trying to stay as healthy as I can, Coconut Oil boosts my metabolism and my immune system. Mercola Fresh Shores Coconut Oil is available in 1 gallon, 1 quart of 1 pint on Mercola's website. Order it here. Also find Mercola on Facebook and Twitter. I recently started using coconut oil in my hair, skin and in my food as well for it's benefits.